After the Launch of New 500 and 2000 Rupees Notes in Latest Indian Currency, Reserve Bank of India has launched the New 50 Rs Note and here we have the every Single detail you wants to know about including Security Features, Size, Dimensions, Color and HD Photos of New 50 Rs Latest 2017 Note. Even the New 50 Rs Note Hit the Market, The Old Note will be Continued in Currency. 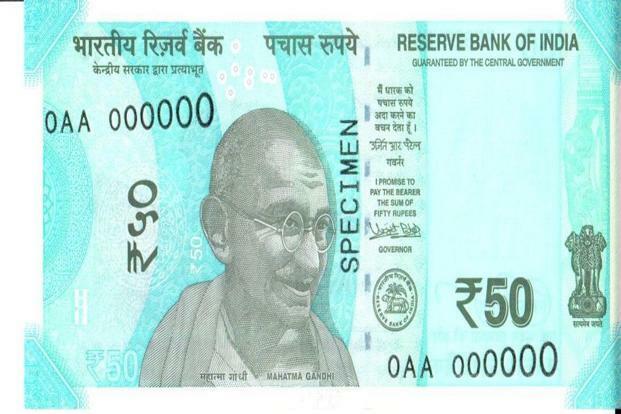 A new fluorescent blue Rs 50 banknote in the Mahatma Gandhi series, slightly smaller and slimmer than the existing note will soon be introduced by the Reserve Bank of India. Note Only the Colorful Look and Great Shine, The Brand New 50 Rs Note has the Standard Key Security Features helps you out to Identify the Real and Fake Note of 50 Rupees. See the detailed Specifications right here. 5. Denominational numeral ५० in Devnagari. 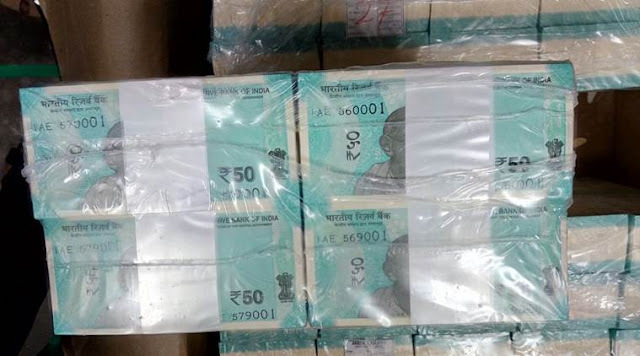 The Picture Below Shows the Bundle of the New 50 Rs Notes Launched by RBI. The existence of two types of banknotes of the same denomination will make it complicated to dispense them from ATMs. However, this will not be a major issue as most banks have stopped dispensing Rs 50 notes in ATMs according to Navroze Dastur, CEO, NCR India. "If the Rs 50 note has to be dispensed from ATMs there will have to be separate cassettes for new and old notes," said Dastur. If you have any Question Regarding the 50 Rs Note? Comment below. We Would Love to Answer. Thanks!